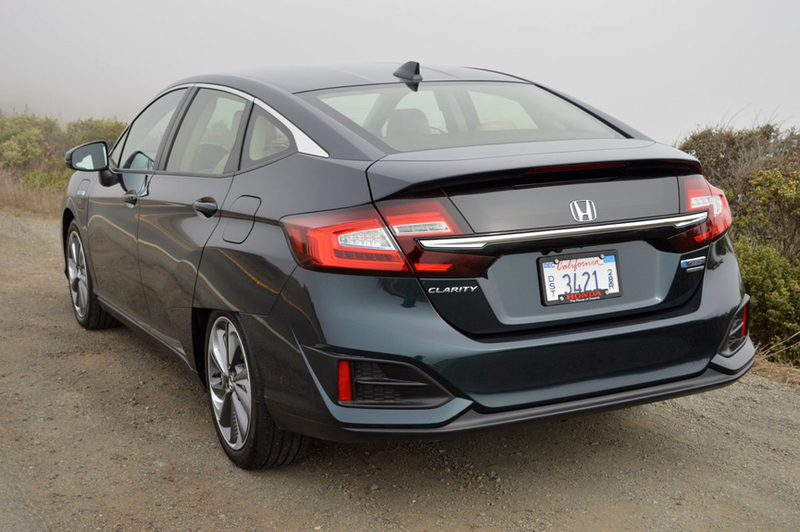 Let me be perfectly clear about this - Honda's Clarity is a plug-in hybrid that doesn't act like one. And that's much to its benefit. It doesn't have squishy, unpredictable brakes. It doesn't have an interior layout that looks like it was designed by a bathroom remodeler. Its dashboard doesn't constantly bombard you with eco reinforcement messages. And its handling is neither treacherous nor slovenly. In other words, the Clarity is miles ahead of other plug-in hybrids because it behaves like a real car, not an overpriced golf kart. But where this hybrid does pay off is efficiency. It's capable of travelling 89 miles on a full electric charge that takes 2.5 hours at 240 volts or 12 hours on 120 volts. So if you run a 45 mile commute each day and have 240 volt chargers at either end, you can basically drive your Clarity for free. But unlike range limited pure electric cars, Clarity has a backup system under the hood - a 1.5 liter inline 4 that will kick in when the hybrid battery discharges. In regular gas-powered mode, the Clarity still returns 42MPG. The only caveat is that the gas engine draws from a small 7 gallon fuel tank, so you will be looking for a fill up well before the odometer records 300 miles. Honda stylists seem determined these days to emulate Ray Gun styling. The exterior of the Clarity is an eye-opening pastiche of samurai sword slashes, from the diagonal side sweep of the sheet metal to the fussy detailing of the front and rear fascias. 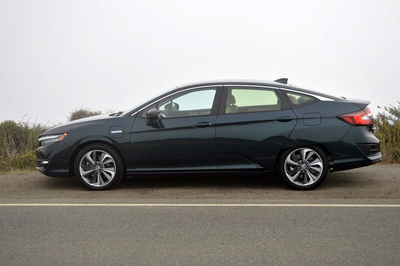 One touch that set this Honda apart from anything else on the road is the semi-skirting of the rear wheel enclosures. A set of turbine-vane alloy rims, with silver and grey spokes alternately fluted and flat, distinguishes the wheel wells of the Clarity. These psychedelic wheels mount sizeable Michelin Green X radials (235/45R18) that dig in and get a grip when you press Clarity through a succession of curves. Given its hefty curb weight (4,045lbs. ), this full size sedan comports itself with dignity and grace. I wouldn't go so far as to call it nimble, but it certainly merits the term sure-footed. Honda thankfully provides its pilot with a "Sport" button that, when engaged, instantly causes the car to spurt ahead as the throttle setting recalibrates itself to more instantaneous response. Simultaneously, steering feedback stiffens slightly, as Clarity enters a more polished sporting dimension. Honda equips the steering wheel with diminutive paddles to control the operation of the CVT transmission. This manual oversight seems to have a rather negligible effect on the car's actual performance. You're never quite sure what simulated "gear" you're in because the video display on the instrument panel does not record gear number, but rather displays a series of tiny chevrons which increase as you shift up and decrease as you paddle shift down. The infotainment center derives from an earlier generation of Honda video screens which lack volume control or station changing knobs. This makes accessing desired programming difficult and distracting, especially on bumpy roads when your hand bounces from one visual icon to another. On the positive side, the steering wheel does contain a volume control rheostat which is much easier to operate than the video screen call out. 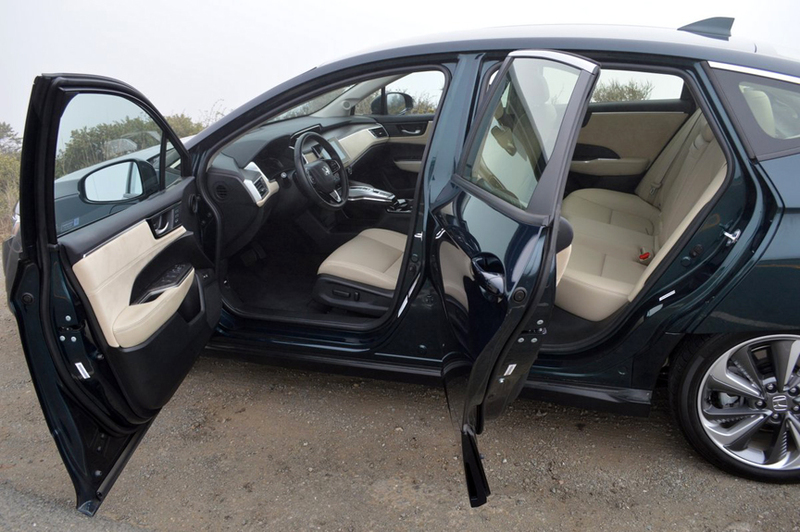 The simplified interior of the Clarity is thankfully devoid of the exterior's exuberance. In fact, this cabin is restful and well laid out. Of particular note is the suede-like material Honda has applied to the dash face and door surfaces. This helps deaden noise, provides a plush look, and melds nicely with the perforated headliner and leather trimmed seating surfaces. 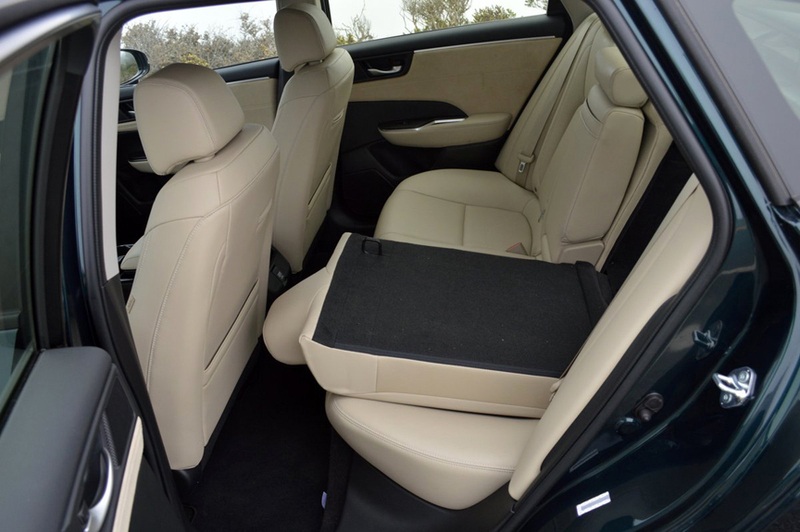 The rear seat backs can be partially folded forward using release levers located inside the car's spacious, 16 cubic foot trunk. While the pass through orifice is not large enough for mammoth objects, it will still allow long boards from Home Depot or the surf shop to be accommodated. The rear seat backs split in time honored 60/40 division. Clarity is the plug-in hybrid for ecologically conscientious buyers who seek a normal sedan environment with few Tommy Tomorrow styling cues. The exterior, however, is a bit more flamboyant so the extrovert in you won't mistake the Clarity for anything else on the road.